With the PA of the Year Award nominations now open, we caught up with previous Legal PA of the Year Rachel Newman to discuss the PA of the Year Awards, talk about her career as a Legal PA and garner some top tips for other Legal employees in the industry. Tell us about your experience of the 2014 PA of the Year Awards. It was all a bit of a whirlwind for me personally. I was overwhelmed to be nominated and was in the middle of a large case and so had limited time to think about the enormity of it. I was nominated by a colleague at work, who I didn’t work directly with, so just being nominated made me feel that others, along with my immediate team, recognised my commitment. The interview was quite different for me as I was on holiday in Dubai and we tried to use Skype, but the connection was really bad and we had to finish the interview over the phone. I didn’t think I was going to win because I feel that in person people can see your sincerity as well as from your answers. Everyone was really great to liaise with throughout the process and the Awards evening was a great night! What do you think the judges were looking for in a Legal PA? I felt that the judges were looking for someone that stood out from the crowd in terms of their dedication to the role and their level of experience. What have you been able to take away from the Awards process? It has really given me pride in what I do. I feel that the work we do is understood by the team of judges and will help the industry remember how important we are to any team structure. What skills do you believe a Legal PA role requires that other PA roles may not? I think that our skill set is more diverse in spanning many job descriptions. Each and every Lawyer works completely differently, and so we always need to be proactive and innovative and to redefine our role constantly. Given the high-pressure environment that you work in, how do you manage your workload? Structuring my day and direct interaction with clients, internal and external, enables me to be aware of needs often before they arise. I am also lucky to have a great support structure internally. Push your boundaries and work collaboratively! What has been the most challenging aspect of your career so far? Over the last two years I have worked on the largest case that our department has ever been instructed on. This case was challenging for many reasons: there was cross-office coordination; timetable of deadlines was very restrictive due to taking on the matter from another law firm; and my role changed considerably from working for my team of fee earners to ensuring that all fee earners were coordinated in their approach. It was important to ensure that there was a core to this team. This made the case more efficient and all aspects of the team’s requirements were met to ensure well-being and innovative learning. For me personally, although a challenge, it enabled me to showcase my ability to work proactively, instinctively and flexibly and to put my motto of “find a solution” to the test. What is it that keeps you in the Legal Secretarial employment market? The law and the cases are always unique and so my experience remains diverse. What’s the best aspect of being a Legal PA? Being a Legal PA allows you to not only hone your secretarial skills but also obtain a specialised understanding. Many of my PA friends who work for large corporations do not feel they have an area of expertise, so I think you have to be able to manage the two when you are a Legal PA.
What are your top five tips for becoming a successful Legal PA? 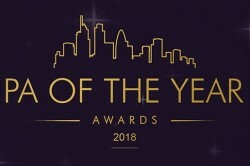 We’re searching for talented Legal PAs to enter SecsintheCity’s PA of the Year Awards 2018. The Awards recognise the professionalism of PAs and acknowledge their contribution to the organisations they work for. Winning Legal PA of the Year 2018 could transform your career, raising your profile across the profession and making your name really stand out. Make 2018 your year by submitting a nomination for Legal PA of the Year today.